“Wisdom in the mind, shoulder responsibility, and the honest heart – these three things I have learned and adopted in my life from the facilitator training I received at Lalgadh Leprosy Services Centre” says Kishori, a 45 years old leprosy affected man who lives in a small village called Kisanpur in Dhanusha district in south-eastern Nepal. He was very pleased to tell the story of how his life has changed for the better, after being turned upside down by leprosy. Kishori Yadav was diagnosed with leprosy in 2008 at Lalgadh Leprosy Services Centre (LLSC) when he was found with a thickened earlobe and a Bacterial Index (BI) of 4.5 which means he had to take a two years course of multidrug therapy (MDT) which he has now finished. He had only primary level education and works hard as a tile maker to support his family. When Kishori found out he had leprosy, he was terrified. He cried alone and did not go back to his house that day. He prayed for a quick and painless death, rather than this illness. 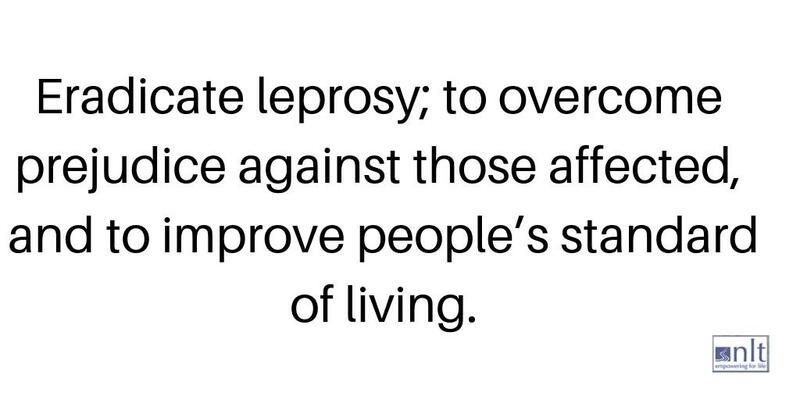 His small village perpetuates the horrible stigma associated with leprosy which forces many into silence and hiding. He knew of one leprosy affected man from his village who was forced to live separately and alone beside the Kamala river. For some time, Kishori kept the disease a secret, afraid that his family would disown him if they found out. However, he could not hide it for long, as his skin was darkened due to a temporary side-effect of the drug he was taking. He was also taking steroids for his swollen leg (caused by a Type One immune reaction) which made him weak and inactive. His wife believed all the old myths about leprosy and would no longer share a bed with him for fear of catching the disease and began to say very hurtful things to him. Kishori no longer felt wanted by anyone in his family. 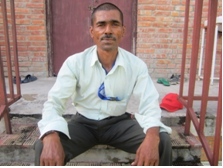 Kishori then came back to LLSC with his wife and she was counseled about leprosy and the problems her husband faced. 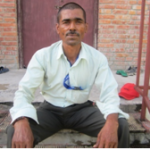 As a result of his time in the Self Care Training Cenre, Kishori joined a Self Care Cell (SCC) in 2012 which converted into a Self Help Group (SHG) in 2013. This SHG was formed in Yagyabhumi VDC by LLSC under the RECLAIM CDR project, run by NLT, for the rights, empowerment and physical wellbeing of people affected by leprosy. Kishori was selected as facilitator of this group and was given facilitator’s training, book-keeping training and self care training. He worked hard to convince leprosy affected men and women to join his group which now has 20 members (10 males and 10 females), and focuses strongly on self-care because it is so important. The group recently started a monthly savings scheme where each member pays Rs 20/- and the group savings now stand at Rs 2640. They use this money for loans to group members, at very low rates of interest, for urgent household expenditures.